This is a compact electronic siren circuit based on three transistors.This circuit is suitable for in corporating with other alarm or siren projects such as burglar alarms, automatic factory sirens etc or a simple push to on alarm. TheÂ electronic siren circuit given here Â isÂ based on a complementary transistor pair consisting of Q2 & Q3 (BC557 & BC 37)Â wired as an astable multivibrator oscillator,which directly drives the speaker.The transistor Q1 is used toÂ provide a full chargeÂ on capacitor C2 when power is turned ON.Â When push button switch S1 is pressed , the capacitor C2Â slowly discharges through resistor R8.This makes the circuitÂ to Â oscillate at a low frequency that increases to a high frequency and kept indefinitely as the capacitor is fully discharged. When the switch P1 is released, the outputÂ frequency decreases slowly as C2 is charged to theÂ positive voltage through resistance R6 and the Base-Emitter junction of tramsistor Q2. When C2 is fully charged to the positiveÂ battery voltageÂ theÂ circuit stops oscillating. 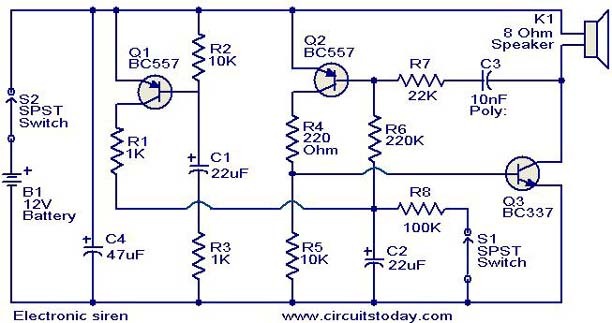 A 12 V battery or a a well regulated 12V DC power supply can be used to power the circuit. The switch S1 can be used to activate the alarm. The switch S2 can be used as a power switch. You can experiment on the tone of alarm by using different values for C2 and R8. was useful I would like to thank.Alarm Sistemi.